Regular upkeep and maintenance are vital to ensuring your mainline and drag hoses are long lasting and stay in peak condition. Cleaning out the line is the best practice for proper hose care — it makes rolling hose back onto the cart easier and causes less wear and tear. 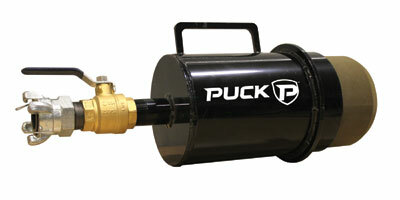 Puck stocks all the essential accessories and parts you need to maintain your hoses’ performance and keep your application operation on track. Ensure everyone is aware of the dangers of compressed air and maintain a respectable distance of 50 feet from the hose and any units when the line is under pressure. Never break couplers until all pressure in the system is diffused. Use gravity to your advantage. Air compressors may not be able to push liquid over big hills. Flow back into the pit through the pump when necessary, or use a portable launcher to start from the top of a hill. Do not allow pumps to spin as air flows through bypasses freely. Be sure to engage clutches if available. Use a pigging bullet or ball for best performance. 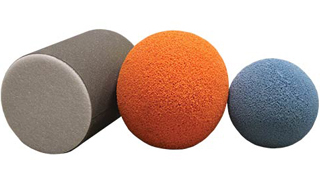 Available for all hose sizes and types, these foam pigging bullets and balls will keep your line clean and running smoothly. 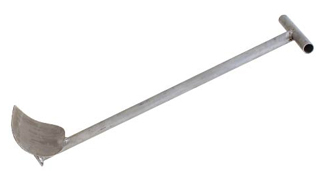 When you need to make a repair or tend to a hose, these hose pinchers make the task easier. 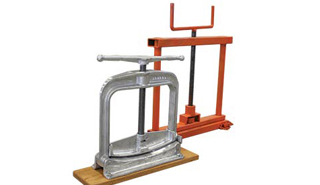 Designed to cut off flow in low-pressure situations, they allow you to get the job done. Offering a direct connect from compressor to hose, these pig launchers can be used at any hose coupling point to clean out your line and maintain a high level of performance, no matter where the hose is at in the field. This lightweight aluminum tool makes it safer and easier to remove kinks in hoses — keeping the liquid flowing and preventing your hands from getting caught.